(March 19, 2019) The intersection of Burbank Blvd. and Lankershiem housed one of NoHo’s many recording havens, but this one was unique and home to a growing number of Artists, Musicians, and Producers looking for the perfect environment to create and birth their next musical masterpiece. Barry Paul Recording Studios was not only a place of inspiration with it’s vintage 70’s decor and stylings, it was a place where you could walk in with any era of music, gear, media, or instrument and leave with a masterpiece ready to go straight to mastering all due to the genius gifting of one man, Barry Paul. 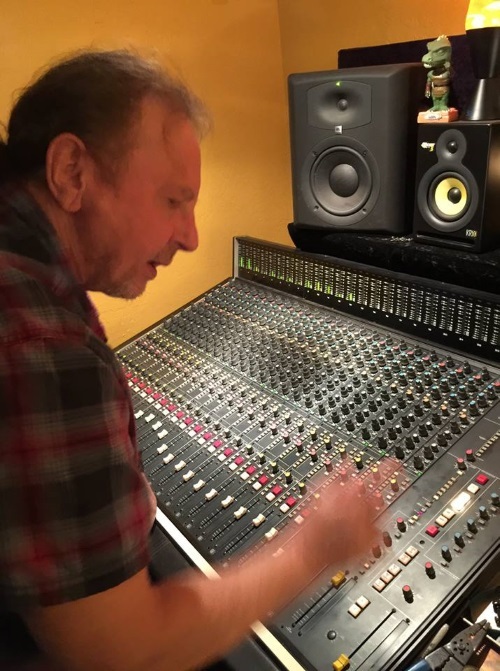 A master Recording and Mix engineer, Barry “Baz” Paul was the “Wizard of Analog” and brilliant at combining analog with digital giving each project a perfect sonic balance across the sound spectrum. I recall one instance where we sent a song from the project “Piano Lady,” by Ruth Ann Galatas, to Capital Records for mastering and they ran his final mix through a spectral analyzer and returned the verdict that it didn’t require mastering! Barry Paul was the main ingredient that pulled the magic out of every square inch of the studio bearing his name. In all the years of my professional career as an Artist/Producer/Songwriter and all the recording studios I had been in, Barry was one of the few master mix engineers who understood the importance of every nuance of sound, whether it was emanating from the human voice or a musical instrument or just the space around a frequency that lends life to a lingering sound wave at the end of a note. I was in awe as I watched Barry finely tune every phrase without disturbing the human nuances that colored a vocal performance preserving the heart and soul of the Artist. He taught me how to wire a studio and the importance of “tuning the room”. I said “Barry, I don’t need to know all that” and he responded “Yes you do! That will make you exceptional!” His nickname for me became “ears” because I would leave the room and come back and hear the slightest change he made while I was gone. We made a great team. Barry’s early days as a guitarist with British Rock Bands which included “The Heavy Metal Kids,” along with years of tours and recordings with “Savoy Brown” and “Made In Japan” contributed much to his understanding of the challenges every Artist and Musician faces during the recording process. As a result Barry believed in treating every clients project as though it was his own. A loving kind spirit, Barry Paul was a huge supporter of the Indie Music Movement in all genres and Barry Paul Studios was home to many of these up and coming Artists as well as major projects. From 1996 till 2019 I never recorded a single project without Barry, and our work together has gone on to be heard by music lovers around the world. This can be said of many of the Artists and Producers he worked with. The list of Artists, Producers and Musicians that trusted their masterpieces to Barry’s ears and hands is as impressive as the finished products that were birthed in his studio facility. Over the years we worked together with Award Winning Artists, Indie Artists, Musicians, and Producers like Isreal Houghton, Andrae and Sandra Crouch, Gladys Knight, The Binions, Jerry Peters, Keith Crouch, Sy Smith, Tata Vega, Robert Gee, Rickey Minor, Olivia McClurkin, Wow Jones, Herman Jackson Jr., “Corny” Mims, Gordon Campbell, Kamasi Washington, Kristle Murden, Sharlotte Gibson, Steven Daniel, Brent Jones, Cassandra O’Neal, Paul Jackson Jr, Kat Dyson, Eric Wahls, Wayne Linsey… so many of the best and in all genres I can’t even remember them all. Barry’s client list covered every genre from Rock and Roll to Rap and he was brilliant in successfully recording them all. I don’t know a single person that had the pleasure of working with Barry that doesn’t have a fond memory of his British wit, kindness and caring heart. His legacy remains in the thousands of songs released that live on as music to our ears and messages to our souls, clearly heard, felt, and experienced as a result of the knowledge and skill Barry possessed as a Recording and Mix Engineer. A true friend to all who were close to him, Barry Paul will live on in our hearts and will be missed beyond expression. Rest In Heavenly Peace Barry “Baz” Paul. Barry Paul transitioned peacefully on March 13, 2019 in a hospital in Los Angeles CA after what was meant to be a routine surgery at a Santa Clarita Hospital. Our sincere condolences to his wife Caryn, sister Linda, his nephew Paul and the entire Paul family as well as a host of friends. There will be a gathering of friends and family in his memory in Los Angeles on March 23, 2019.